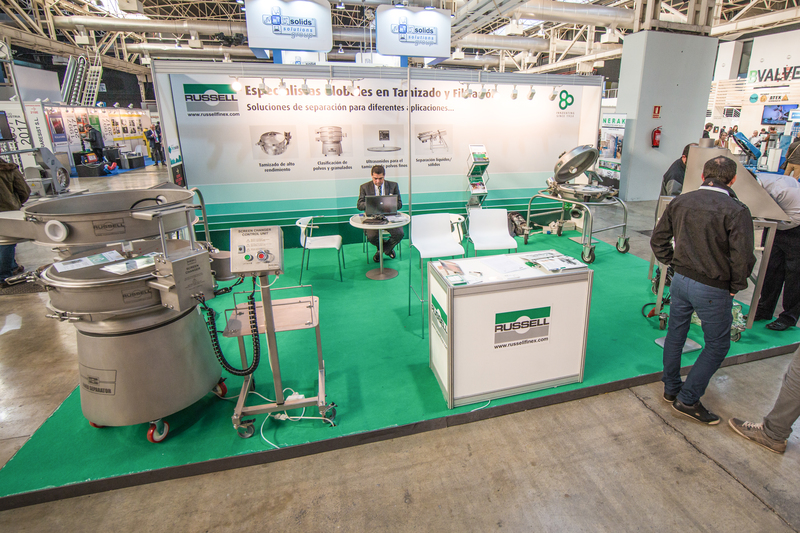 La Farga de L'Hospitalet, Barcelona once again hosted the latest edition of Exposolidos – Spain’s premier trade show for the process industry. The event provided the perfect platform for professionals from across Spain, to meet and join the conversation about the latest industry trends and processing technologies, from solids, bulk materials and powders to semi-solids and liquid-solid separation. Russell Finex was pleased to play a part in this major event. The show saw a wealth of visitors take advantage of the opportunity to view live demonstrations of the latest processing technology, including separation equipment for food, pharmaceutical, metal powders, chemical, ceramics, paints and coatings applications. Machinery manufacturers, suppliers, and industry experts covered a range of areas, from raw material and ingredients processing to packaging and logistics. Russell Finex presented its latest developments in separation technology to its Spanish and European audience at the show. Experienced sales engineers provided advice and insight on a range of industrial screeners and filters, as well as live machine demonstrations, helping visitors discover the exact solution for their specific application. This included safety bag-tipping equipment, vibratory grading separation and pneumatic screening technology. Russell Finex enjoyed a record number of enquiries for a Spanish trade show, and is already looking forward to returning to Spain, at Expoquimia 2017. With various subsidiaries across Europe and the world, Russell Finex is a global leader in the manufacture of sieving and filtration technology for a range of industries. To find out more about which solution best suits your application, try the new Interactive Application Finder now, or contact your local sales engineer today.